WHAT ARE THE REQUIREMENTS TO COMPETE? All building types are welcome! Commercial, industrial, institutional, non-profits, multi-family, education, retail, campus, owners and tenants (sorry, no single family residential at this time). New buildings are not eligible as you must have energy data for all of 2018 to establish your baseline. Any organization can enter one or more buildings of any type in the competition as long as the building is located in the state of Michigan. WHAT IS THE COMPLETION TIMELINE? Competition is open to new and returning contestants from January 1st through March 31st. On March 31, the registration period will close and categories are determined based on type and number of building entries. 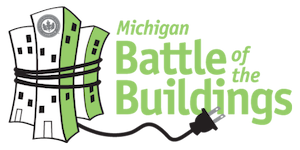 Participants may choose to attend any number of Battle of the Building events offered throughout the year. The competition will end on December 31st. Using the data submitted to Portfolio Manager, USGBCWM will determine which competitors have shown the greatest energy reduction using each contestants weather normalized source EUI from January 1st to December 31st. A third-party certification will be conducted on winning buildings to ensure the data input into EnergyStar was accurately reported. Energy use is measured in kBtu’s. This data comes from utility bills that are entered into EnergyStar Portfolio Manager by you (or your representative). EnergyStar converts the information you enter into a whole building kBtu and divides it by the building’s square footage. The result is the building’s Energy Use Intensity (EUI). To calculate the energy percentage difference over the competition year, the weather normalized EUI from the previous year is subtracted from the weather normalized EUI of the current year. The calculated difference is how we determine the biggest losers. Water use is measured in gallons. This data comes from water bills and that are entered into EnergyStar Portfolio Manager by you (or your representative). EnergyStar converts the information you enter into gallons and divides it by the building’s square footage. The result is the building’s Water Use Intensity (WUI). To calculate the water percentage difference over the competition year, WUI from the previous year is subtracted from the WUI of the current year. The calculated difference is how we determine the biggest loser. Winners will be recognized at the Michigan Energy Summit in April of the following year.